You'll have a wonderful addition to your bedroom setting with this media chest. The piece carries a fine which provides a rustic appearance. Plus, the four drawers, one cabinet and two open compartments are wonderful for keeping DVDs, video games, CDs and various media players. You'll be set with this media chest in your bedroom decor. The Trestlewood Media Chest by Progressive Furniture at AHFA in the area. Product availability may vary. Contact us for the most current availability on this product. Case Construction End panels and bed panels are pine veneers, all other components are pine. 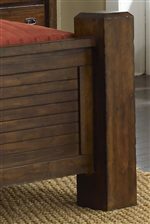 Add a rustic appearance to your bedroom decor and entertainment area with the addition of the Trestlewood collection. Each bedroom piece carries a mesquite pine finish that evokes a warm and welcoming ambiance. Plus, thick, rectangular bed posts, bail handles and plenty of storage space are also included. Create the perfect sanctuary to leave the day's troubles behind with help from the Trestlewood collection. The Trestlewood collection is a great option if you are looking for Casual furniture in the area. Browse other items in the Trestlewood collection from AHFA in the area.